This is a city-based adventure - something I always enjoy - and it opens with a note that for best effect the party should be strangers to the city in which you set it. Apart from that, the city needs to be large enough to support a high-powered and famous wizard - one Emirikol the Chaotic, as it happens. The introduction explains how the situation that the party will face came about, but as figuring it out is a major part of the adventure I'm not going to describe it here. The adventure itself begins with a fly-by shooting whilst the party is going about its own business in the city. 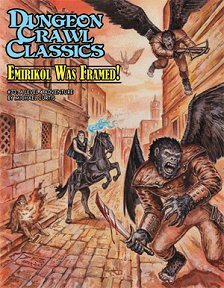 The perpetrators appear to be winged apes armed with crossbows, who have killed a merchant, caused havoc in a shopping street and now are turning their attention on the party - probably the only folk around who look as if they could do anything about the attack. They appear to be under the command of a robed, mounted fellow who is casting some kind of fiery spell-bolts at anyone getting in the way. By the end of the day, the party is approached by the City Watch captain seeking their aid in bringing the perpetrator to book: apparently that robed figure was none other than Emirikol the Chaotic! He's accompanied by two concerned citizens, another wizard and a lady whose brother was once Emirikol's apprentice... until he was murdered by his master. They have a plan, but need some adventurers to carry it out. Each of the three has several pieces of information to impart that should aid the party in their mission. The climactic 'boss fight' at the end has some truly epic features, and it is now that the party may finally discover what's really been going on. There's a possibility that the party may feel a bit marginalised, but they have plenty of opportunities to take independent action which you should naturally focus upon, letting other things continue as a backdrop. Just about every possible conclusion is covered, most have scope for further adventures too. This one lives up to the inherent promise in Dungeon Crawl Classics! Return to Emirikol Was Framed page.